The heads I originally took off the engine, I sold on eBay because at the time my plan was to buy new aluminum heads. Then as time went on and funds for the rebuild got smaller I decided I would just buy a cheap set of stock heads and have them machined for better flow, so that is what I did. 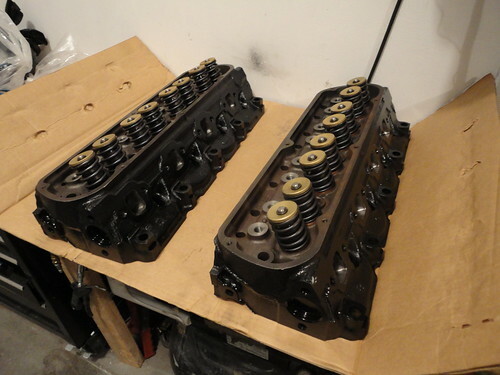 I found a cheap set of heads…on eBay and sent them off to a friend of a friend’s machine shop. The guy, who I never actually met, called me a few weeks later to discuss what I wanted done. I told him I was building a 331 stroker and I wasn’t planning on racing it or anything but I wanted to make enough power to make some noise. After a little back and forth I basically told him to give me the works; port and polished, valve job with larger valves, and any other machining wizardry he had up his sleeve. A couple of months later he called back to tell me that the heads I gave him are just not very good. They where in fine shape but the amount of work he would have to do to get them to flow they way I wanted would not be worth it. He did have a set of 351 heads that he knew he could get to flow nicely, if I would be willing to use them instead. Well hell yes! Using 351 heads on a 289/302 block has long been a trick to increase power and with a machined set there would be plenty of power. At this point it had been a few months and it sounded like nothing had really been done, which really did bother me. My thought with sending heads to a machine shop was that the heads would get built and then they would call wanting payment, thereby forcing me to spend the money to get them. What really happened was life went on, as it does, and suddenly I had a few more important things to worry about, like my recently pregnant wife, oh yea this whole cylinder head story started before Gillian was even pregnant, then my new-born daughter. We would play phone tag a few times, actually I think he was avoiding me, but my thought was if he is not in a hurry to get paid I am not in a hurry to pay him. Finally, after all the panic attacks of new babydom had calmed down I started hounding him for the heads. I hadn’t paid this guy a dime so I really wasn’t that angry but if I was ever going to get the Falcon running again I needed these parts, not to mention I was using the fact that I hadn’t gotten them yet as an excuse to not work on other things on the car. This entry was posted on October 12, 2010 at 3:22 am and is filed under Cars, Falcon, Rants. You can follow any responses to this entry through the RSS 2.0 feed. You can leave a response, or trackback from your own site.